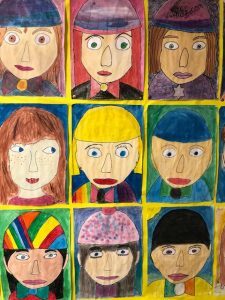  » Fifth Class » You&apos;re currently reading "There’s a Starman waiting in the sky – 5th Class in September"
Mrs Lennon’s fifth class have had a busy September. We are delighted to be together in a new class with many new friends. In Gaeilge we have been practicing our Mé Féin comhrás and we enjoy chatting about ourselves ‘as Gaeilge’. We have also learned to draw ourselves, and were quite surprised to discover the true proportions of our faces! 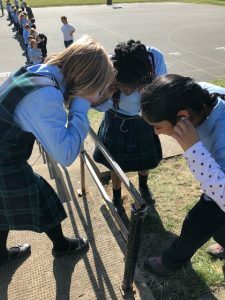 In science we did a fun experiment called ‘Hanger Clanger’ where we learned about how sound travels. 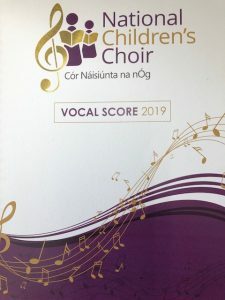 We have been rehearsing for our National Children’s Choir Concert which will take place in the National Basketball Arena in March. Our favourite song so far is Starman by David Bowie. We have learned about the Beaufort Wind Scale and were able to calculate wind speeds during Storm Ali. 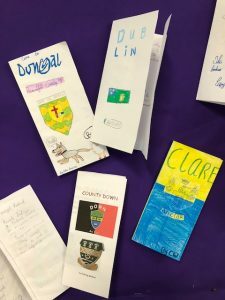 In History we learned about the Aztecs and we designed holiday brochures for Irish Counties in Geography. We enjoy our gymnastics with Jay every Tuesday and have also been learning how to play cricket with Diarmuid from Cricket Ireland. Ms Basquille has been coaching us in running techniques on Fridays. Check back next month for some more fifth class news!